2012 was a very hard year – for reasons I’ve shared here plus many, many others. You all have been so patient with me. Watching 2012 end left me thankful and sighing big sighs. It ended well. I had the privilege of leading the music at our new church home here in Virginia on the last Sunday of the year. I ended the difficult year, praising God for His goodness. Then on December 31st, I joined a friend as she ran her first 10K. Through the last months of the year, Psalm 25 sustained me. 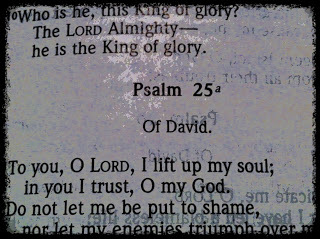 To you, O Lord, I lift up my soul; in you I trust, O my God. It’s a psalm I know well, due to it being the focus of one of my favorite worship songs. As hope looked to dwindle, as our condo didn’t sell, as my father fell more ill, as life thinned out in painful ways, Psalm 25 sang to my soul like water in a dry and weary land. I decided to make this my psalm to ring in the new year. Have you ever selected a psalm to focus on? Psalm 34 was another that I have focused on in previous years. I simply read it often, often aloud, pausing frequently to reflect. Consider selecting a psalm to begin the year with. I will be writing on this psalm in the coming months. This entry was posted in new year, personal growth, psalm 25 series, psalms by Brenna Kate Simonds. Bookmark the permalink.